That moment at the end of the day when both children are fed, bathed, read to and then fall asleep, is gold. Ask any parent. It’s freedom! No more nappies! No more negotiating with a 2.5 year old! And nine times out of 10, I fall asleep watching another repeat of The Big Bang Theory. What a waste of treasure time! I stumbled on to a solution by accident. I made some Christmas gifts for the day care mums, with plans to bundle them up in some cheap hyacinth baskets from Kmart. 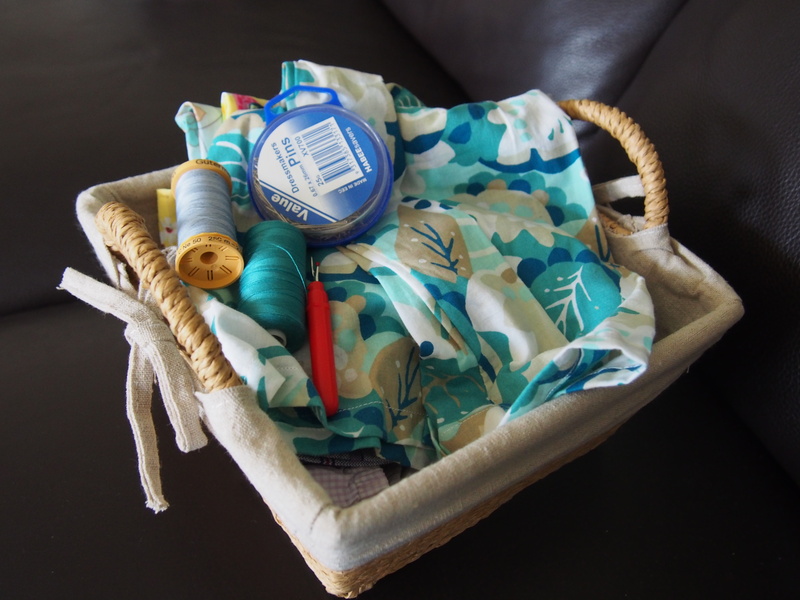 Before I got far, a basket was hijacked to keep a little sewing job corralled (unpick the modesty stitches on a crossover top, add a press stud and BOOM! Breast feeding friendly shirt!). So now, of an evening I can kick back on the sofa, get my stitch on (HAZZAH! ), and tick a few jobs off the never ending list. I might even have an adult conversation with Brett. Me: Alby has swimming tomorrow. Brett: Do we have any swimming nappies? Me: Yep. Don’t know why we bother, every kid pees in the pool, they only catch poo. It’s not like Alby does that.